Thank you World Market for sponsoring this post. 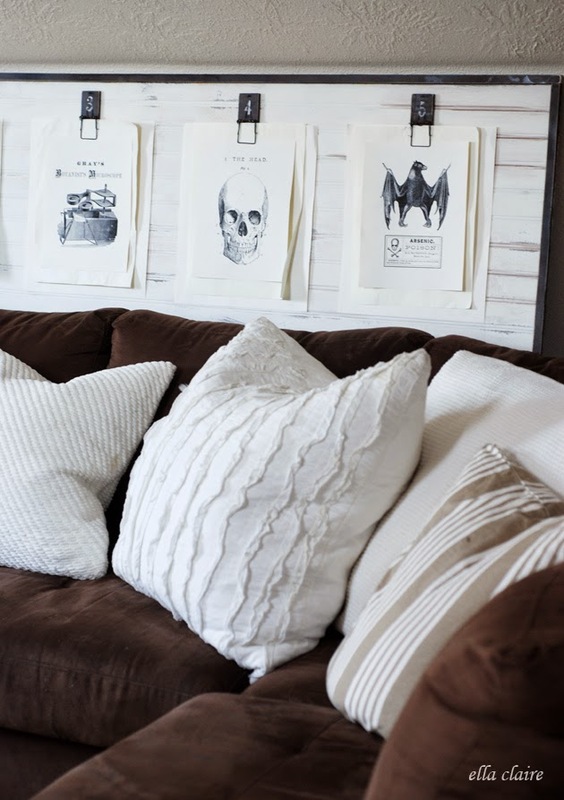 All decor ideas, and opinions are mine. 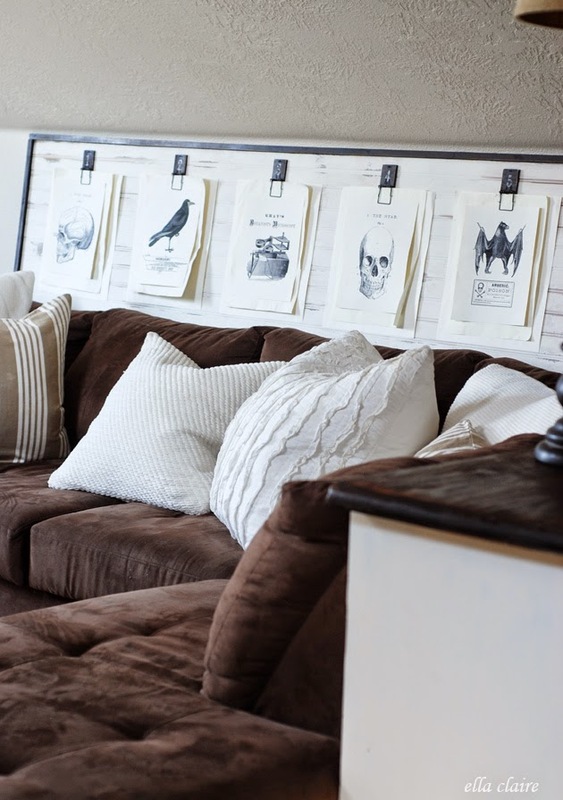 I am so excited to be sharing my Fall home tour with you today! We have been working our tails off painting and finishing the renovations that we have made… and I am SO thrilled to be finished! I LOVE Fall. 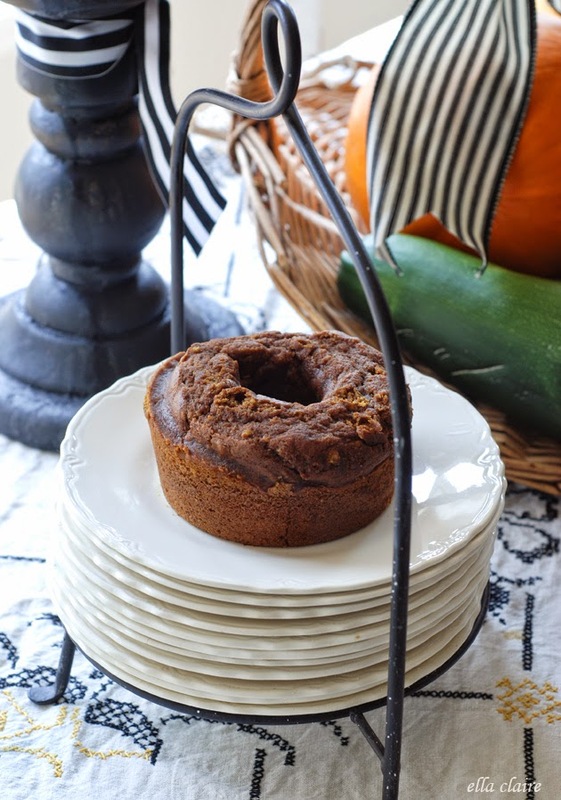 I love the warm colors, the crisp air, the smell of spices and pumpkin. 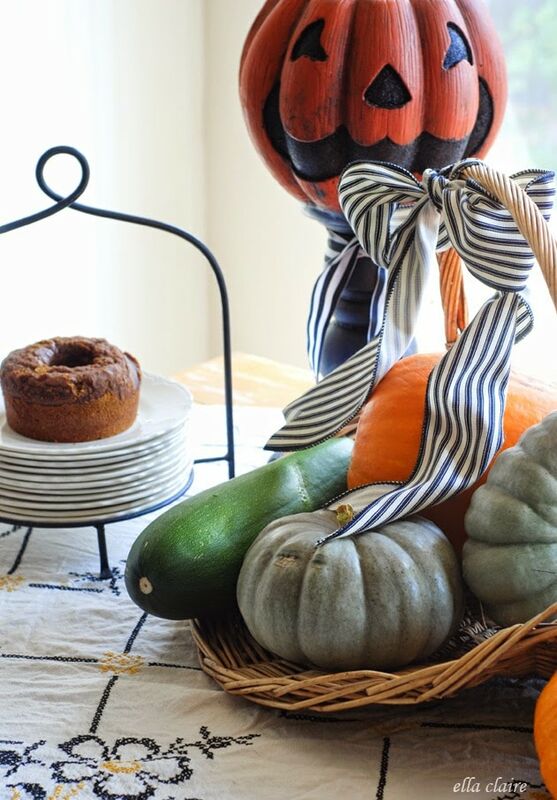 I also love decorating for Fall and Halloween. 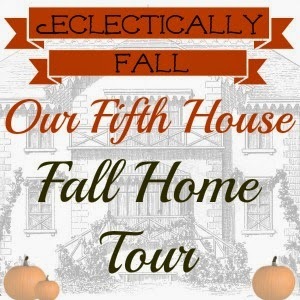 I am so honored to be a part of this Fall home tour put on by Kelly of Ecclecticaly Vintage. You can start the tour on her site HERE if you would like to go back to the beginning. I thought we could start in the kitchen since that is the room that has undergone the most major rennovations. I have never really decorated the kitchen for the seasons before because I never really had the counter space for it. 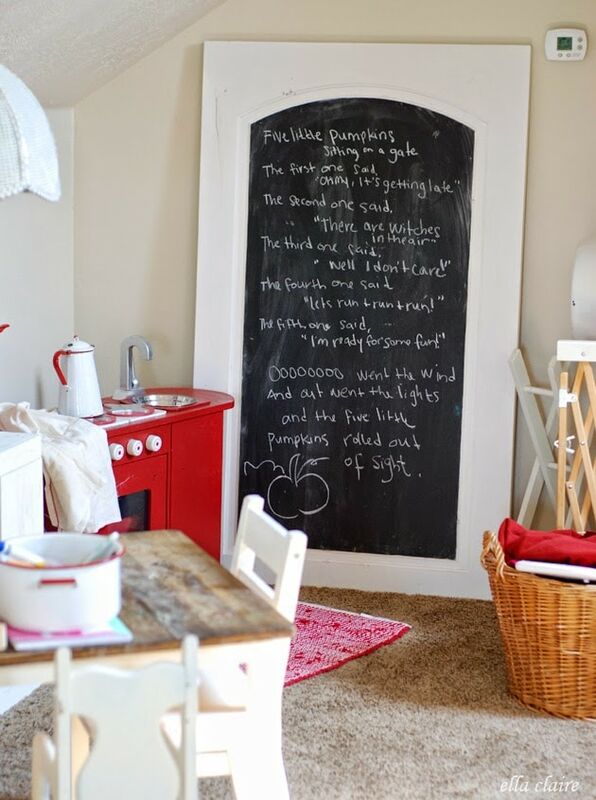 Now it is my favorite space to play with and I can’t wait to get the tops of my cupboards decorated. This home of ours has very little pantry space, so I wanted to add some in the kitchen. I had this idea that I thought would kind of be reminiscent of an old country store. I love, love, love the charm it adds to my kitchen, and having all of the food that we use most regularly easily at hand has been wonderful. 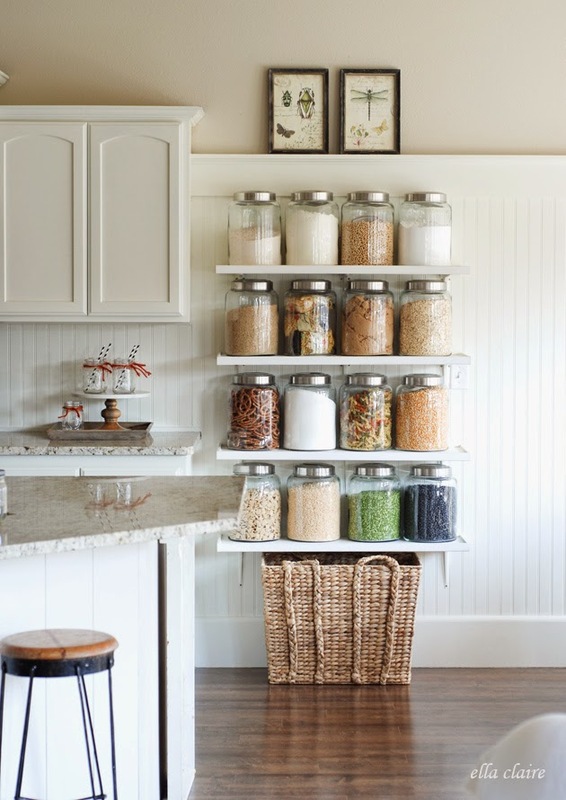 I can’t believe how much space this frees up in the pantry! I will be sharing more pictures, as well as a little mini tutorial on these shelves on Monday. I searched for months for the perfect jars for these shelves. I needed them to be large and airtight. It was SO much harder to find some like that than I thought. I was so relieved when I found these babies at World Market. They were well made, thick glass, airtight, and cute. I collected them over several months, buying one here and there. I think I may paint the lids. What do you think? The cute cake stand and pictures up above are also from World Market. 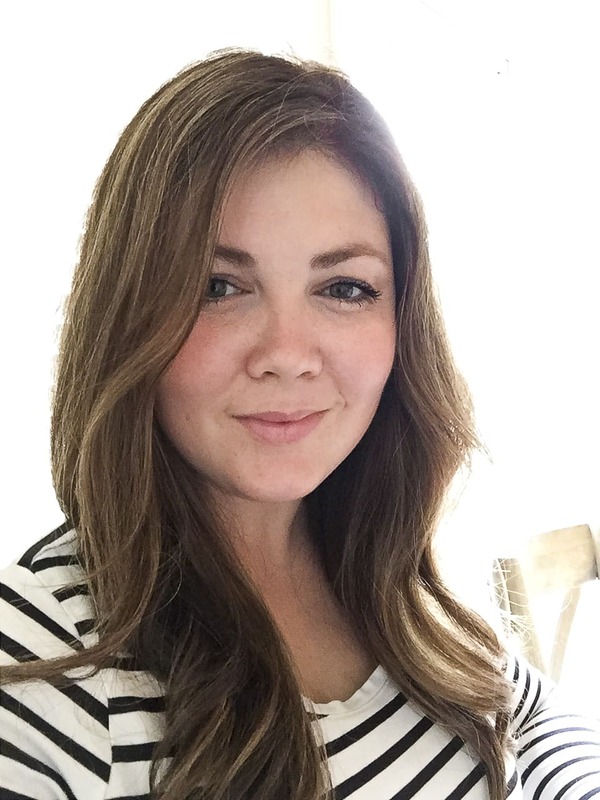 I think it is fun to use things like these mason jars with the cute stripey straws for seasonal decor because they are easy to change out for the different seasons, and it didn’t cost anything since I had all of it on hand. 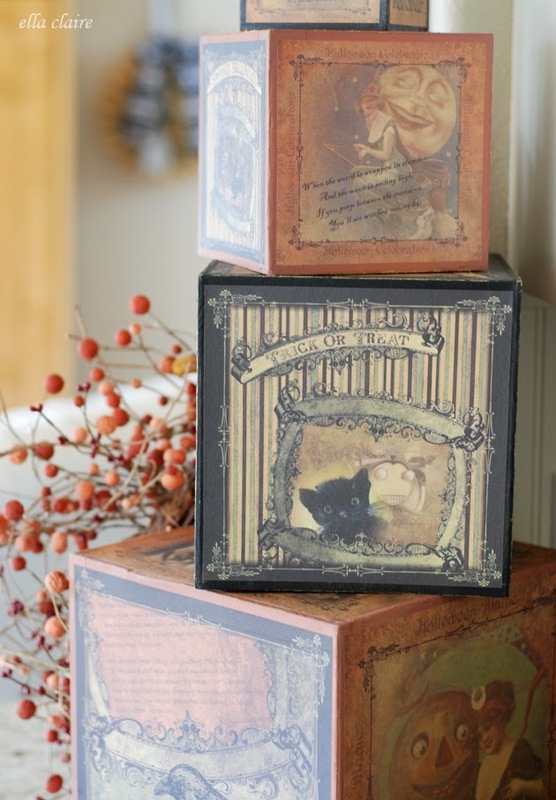 I had these cute Halloween boxes in my stash. 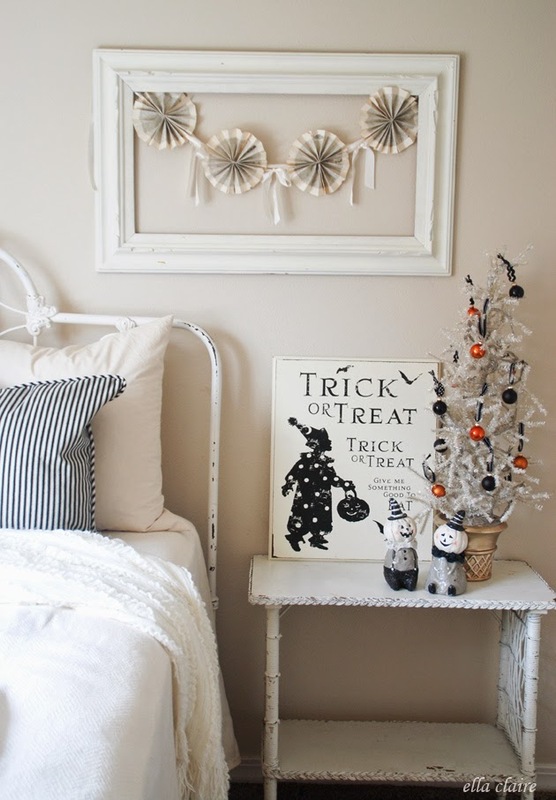 I love decorating with the cute vintage Halloween images. 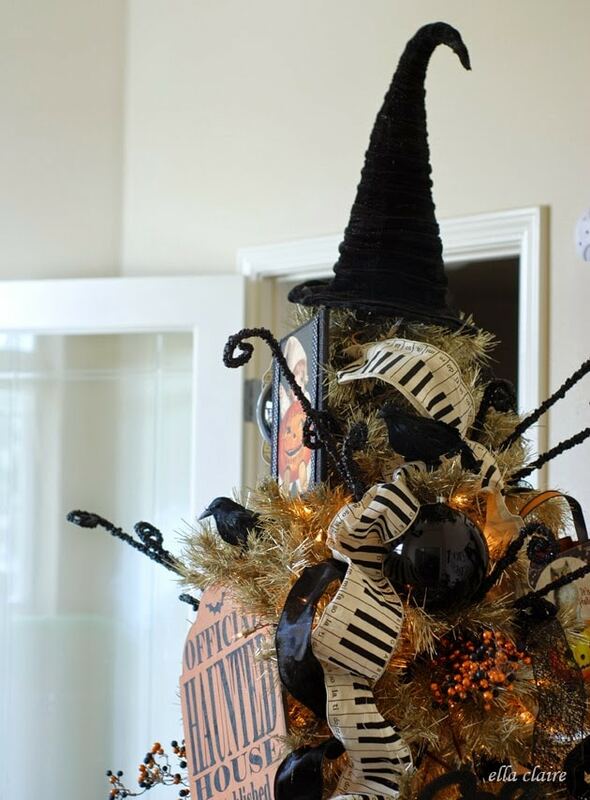 I think that is part of the reason why I love to decorate for Halloween. 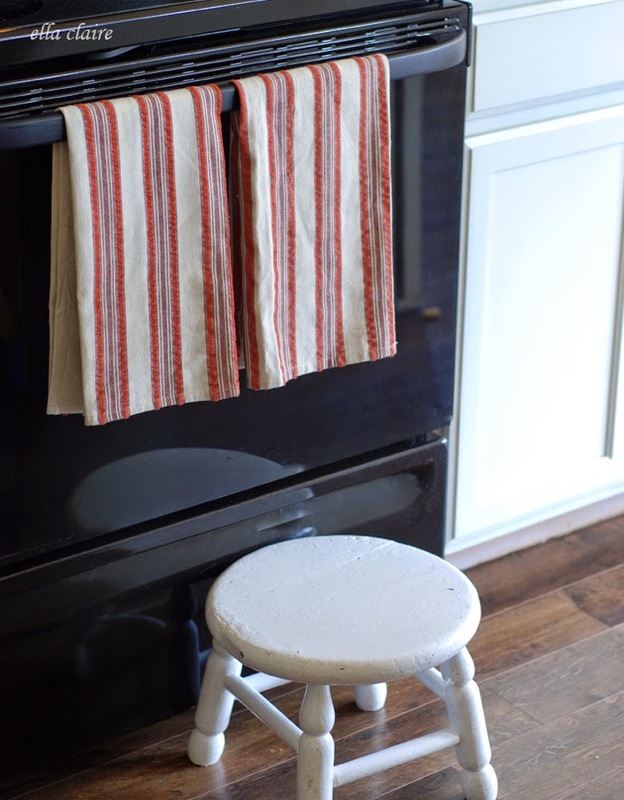 Cute towels also from World Market. 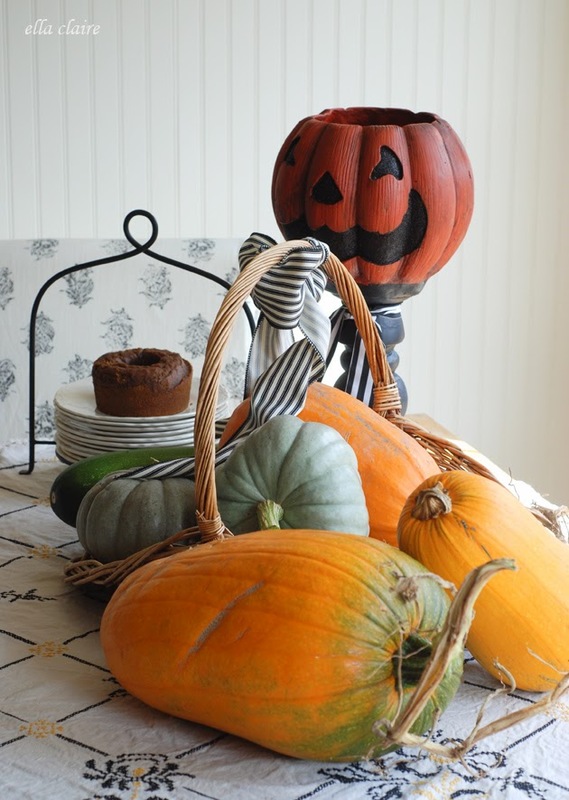 We are so proud of our little pumpkin harvest from our garden this year… hence the proud display on the table. In the family room, I just added a few Fall touches. 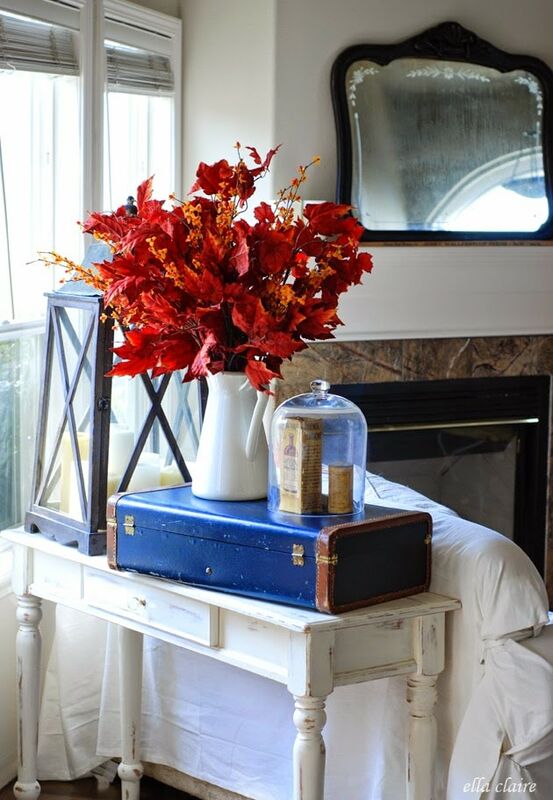 My favorite Red and gold leaves give such a fun punch to the room, and tie in well with our terra cotta colored pillows. I have had them for years, and always enjoy pulling them out. I added a basket to the back wall that I think I will be keeping up all year. I am in the process of slipcovering this couch, but wanted to live with the fabric for a little while before I went to all the work just in case I didn’t like it… so it is just safety pinned on there. I pulled out my book page wreaths that I made several years ago, and added the fun black and white ribbons. I picked up these old medicine packages at a yard sale probably 10 years ago, and I think they are so fun to add to my Halloween decor. 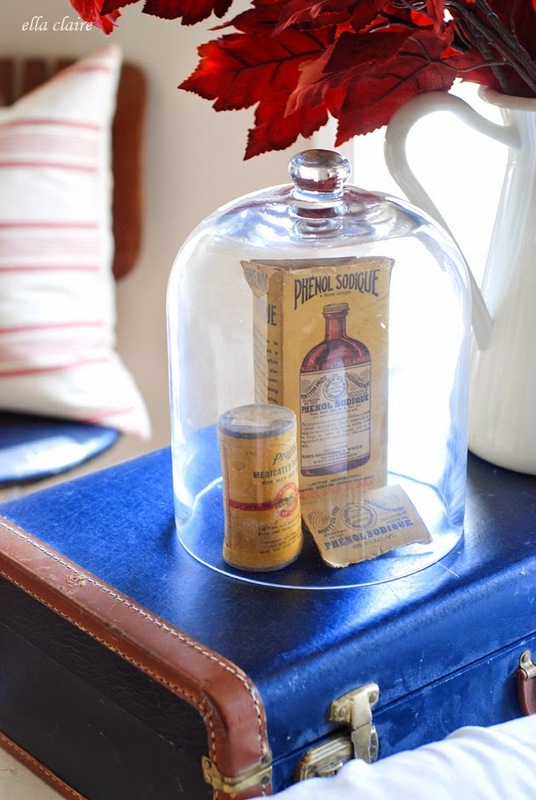 One of these days, I may put together a real apothecary display. I sure love that delicious old packaging and typography. 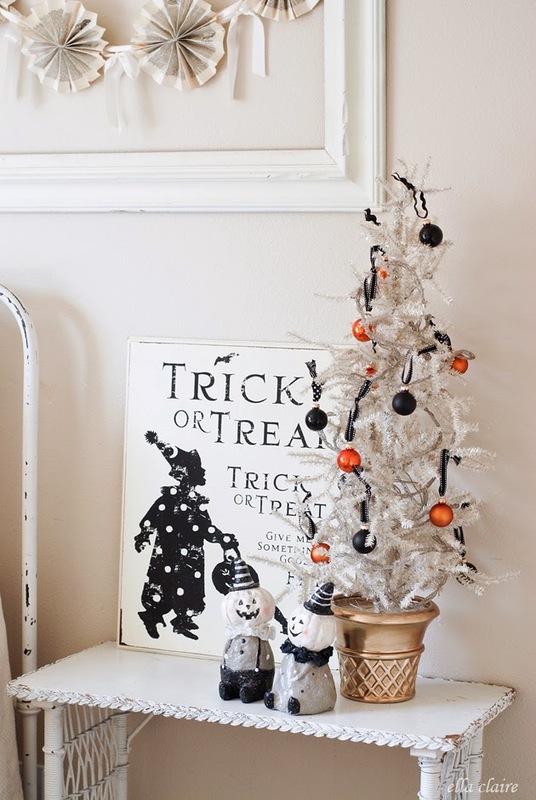 One of my favorite things to do is decorate my tinsel tree for Halloween. My Ella loves it too. I put it in the entry/office this time instead of the family room. It is so fun. I am sure the neighbors think I am a little nuts for having a Christmas tree up already though :). 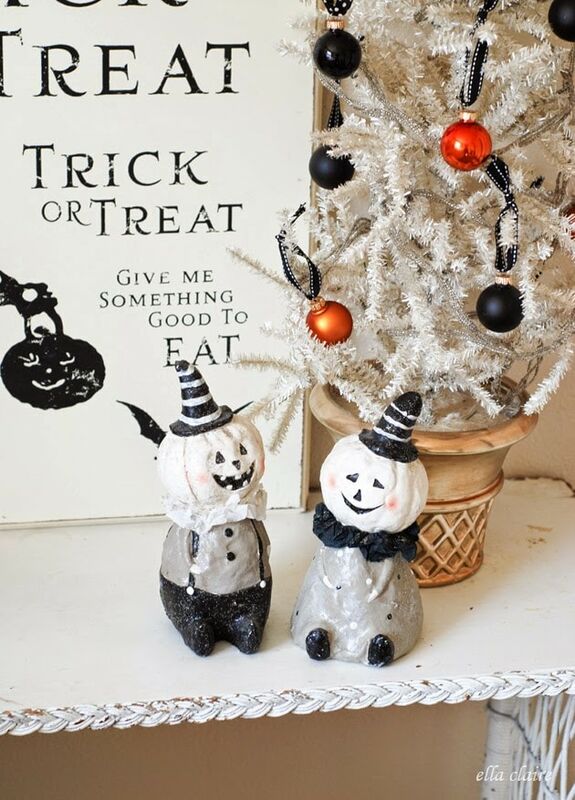 Most of what I used were just things I had from previous years, or decorations that I made.These cute vintage glittery Happy Halloween ornaments are new this year though. You can find them here. I had a really hard time getting a decent full picture of it with our cloudy weather… but here is one to give you an idea. 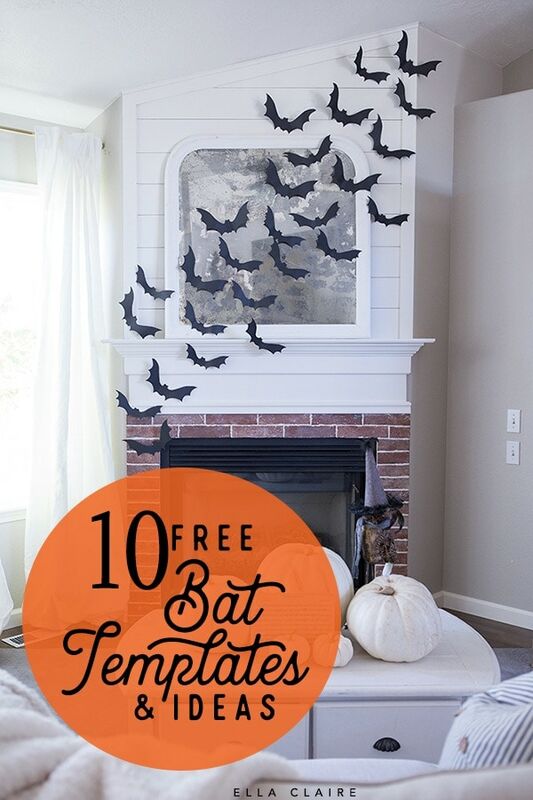 I shared this free printable Trick or Treat banner a few weeks ago HERE. While Ella was sleeping, I snuck in and decorated her room. When she woke up, she was SO excited! 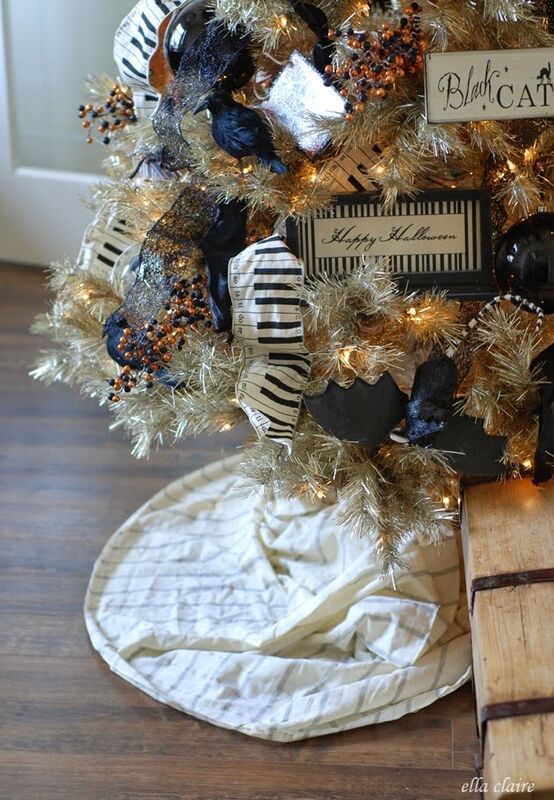 I love reusing my Christmas trees. 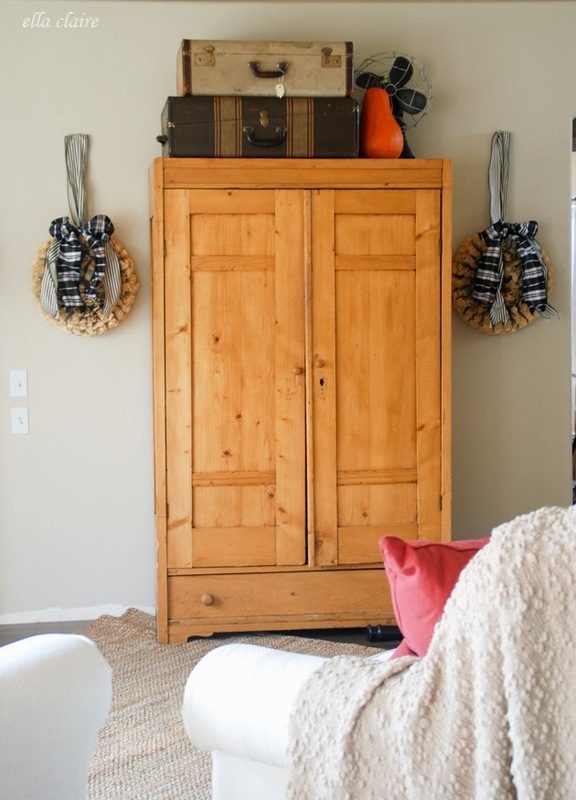 It takes up less storage space and costs less than having all different decor for the holidays! 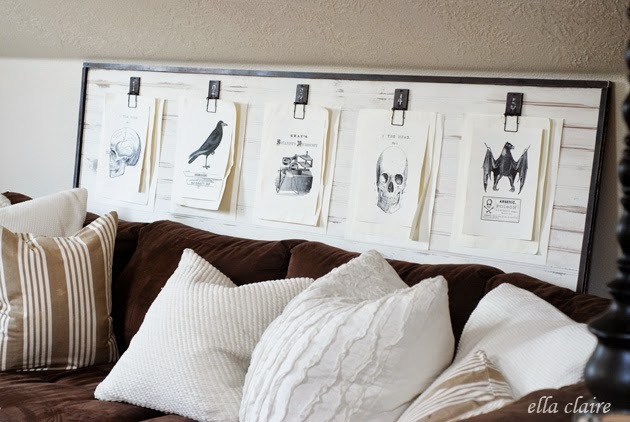 Up in the bonus room, I printed off and hung these cute little vintage graphic collages, that I made from The Graphics Fairy images, on the mousetrap gallery wall board. I will be sharing more about this as well as the free download in the next couple of days! 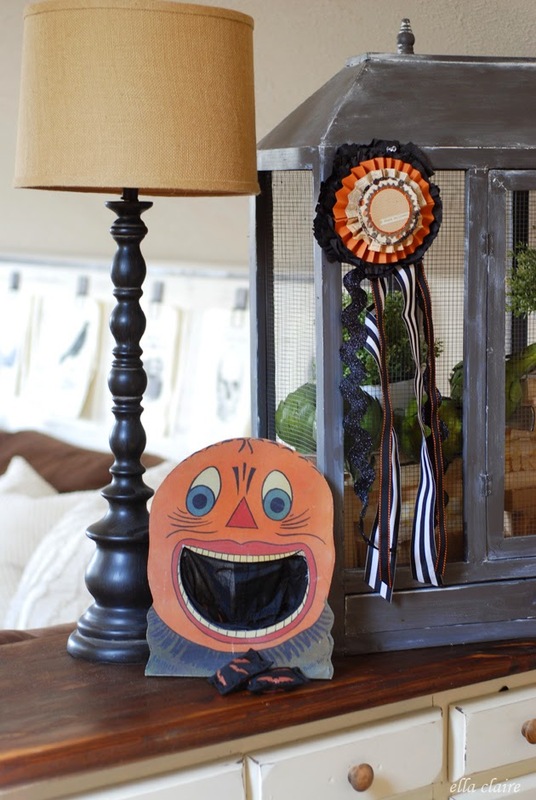 Ella loves to play with this little pumpkin head sack toss game. The festune is one I made a few years ago here. 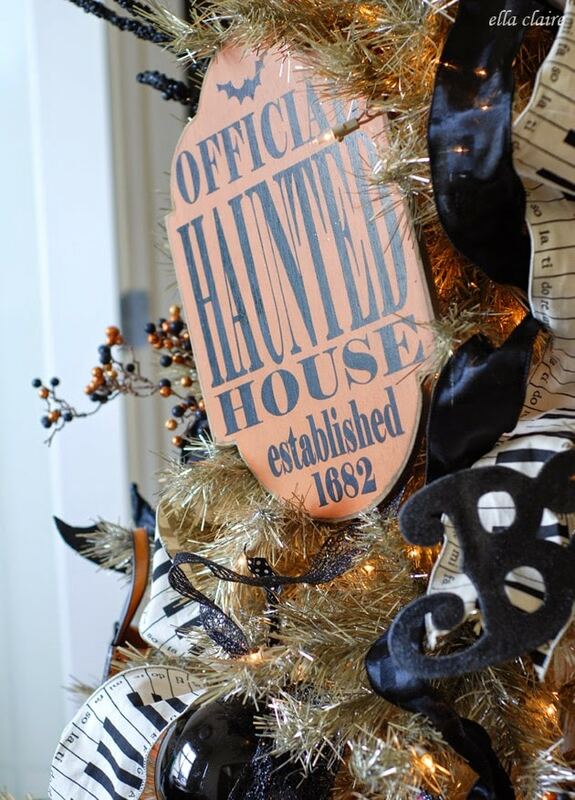 I hope you enjoyed my Fall and Halloween decor! 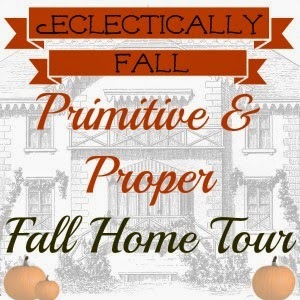 Next stop on the tour is Primitive and Proper. 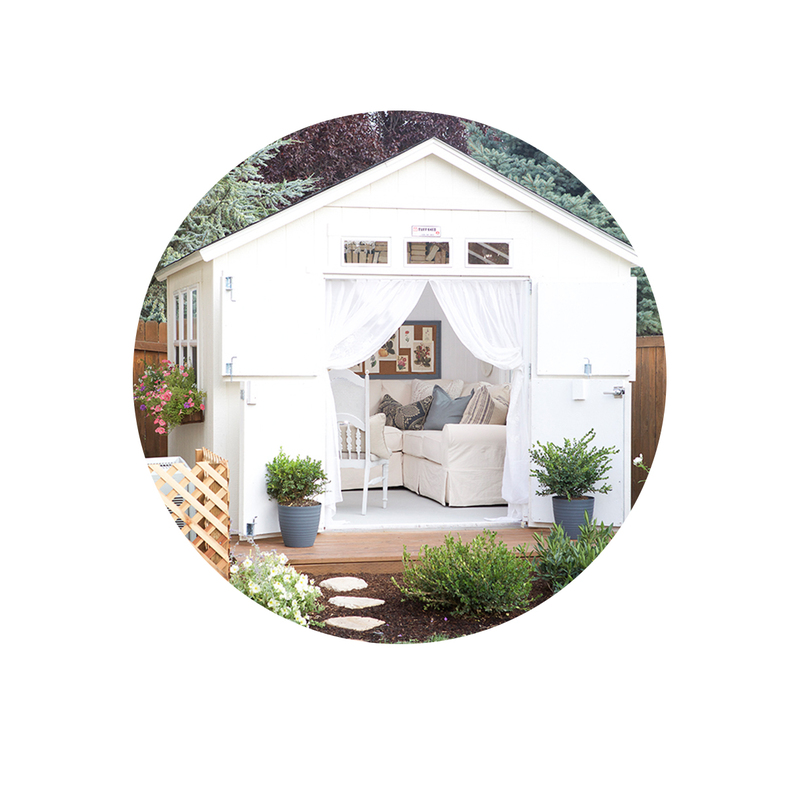 I hope you will pop on over and see her beautiful home. Your tour is gorgeous and I’m dying over the food containers in your kitchen! I might have to do this! I love that you used the Christmas trees too! Great idea! You always amaze and inspire me! Thank you for sharing your beautiful home with us. Your home looks wonderful. Like you, I love to use vintage Halloween graphics. Each year I make an apothecary for “Potions Class” for my Harry Potter Halloween Party. It is fun to use gummy worms as flubbed worms and malt balls for bezors. The kids use the candy/potions to make their own ice cream sundae. They go CRAZY for this activity. I highly recommend it! BTW, I have a super small pantry. So, I am going to copy your shelving/air-tight container idea. Now I know to go to World Market for my containers. Thanks! Your tour is such a joy to see! No space was left wanting, everything is so creative, charming and autumn. I have to thank you for a great idea I got here. I have an old wonderful house which is not of the big open space variety (part of its charm) , I have a single lower cabinet on the corner where one exits the kitchen into the main hallway. 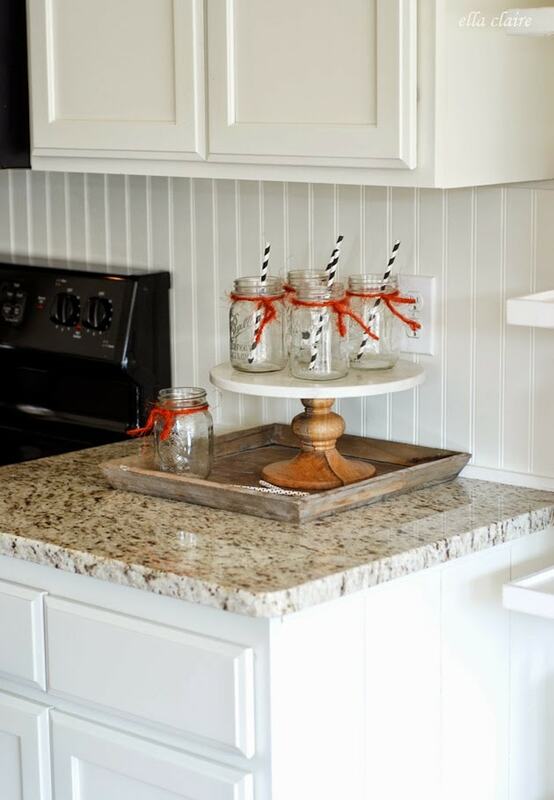 I always have a difficult time finding a decorative touch for the top of the counter at that space. 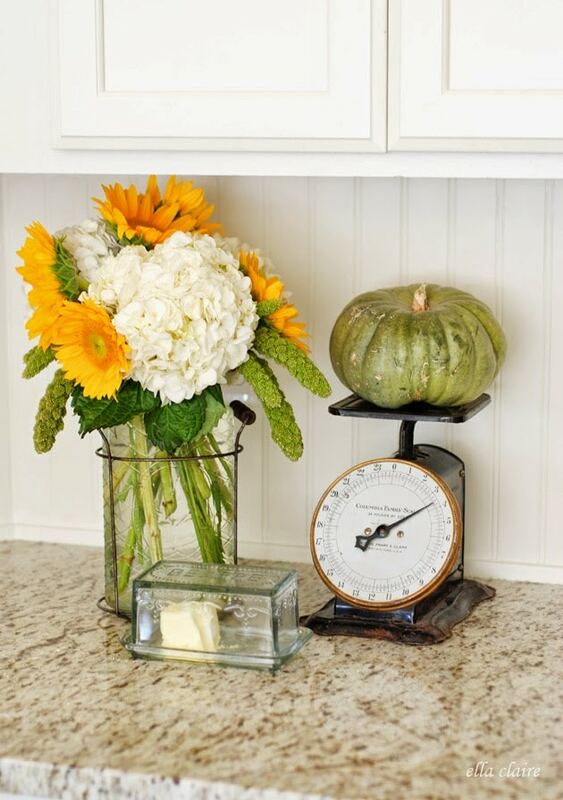 Your lovely little vignette of the glass cylinder holding white and yellow flowers along with the scale and small green pumpkin squash is adorable and if you don’t mind, I’m going to steal your idea and do that on my corner cabinet. It will be such a pretty touch as one leaves the kitchen and make me happy every time I see it! Today is the first time I have ever visited your blog. 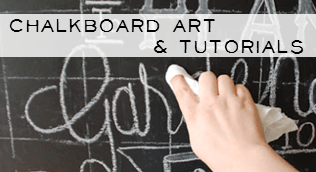 I was searching for methods of ironing burlap and came upon your blog! What a wonderful new surprise! 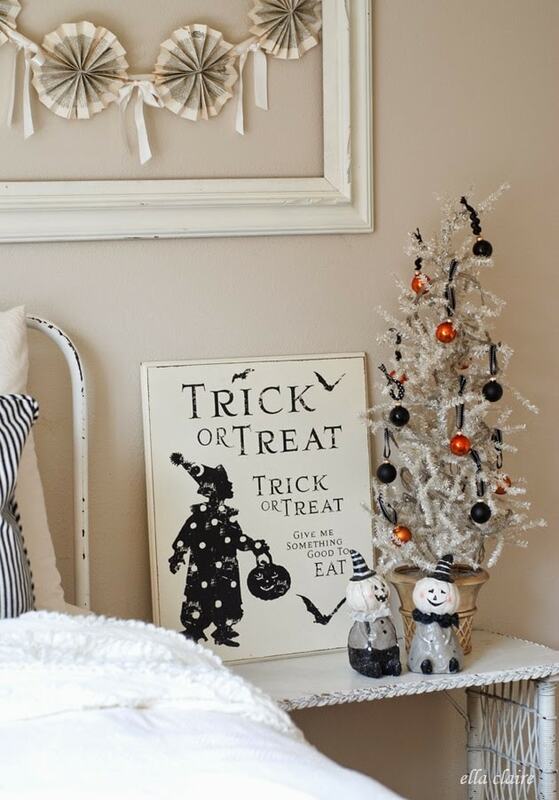 your home looks fabulous- i love the halloween tree! so unique! shut up right now! The jars in the kitchen, the black and white sign, all of it!!! LOVE! I adore your lovely home.What a wonder style you have. Thanks for sharing. Beautiful tour, and I love the WM jars. I think I need some now:) Are they airtight? I especially love the display by your daughter’s bed. Really, really cute. 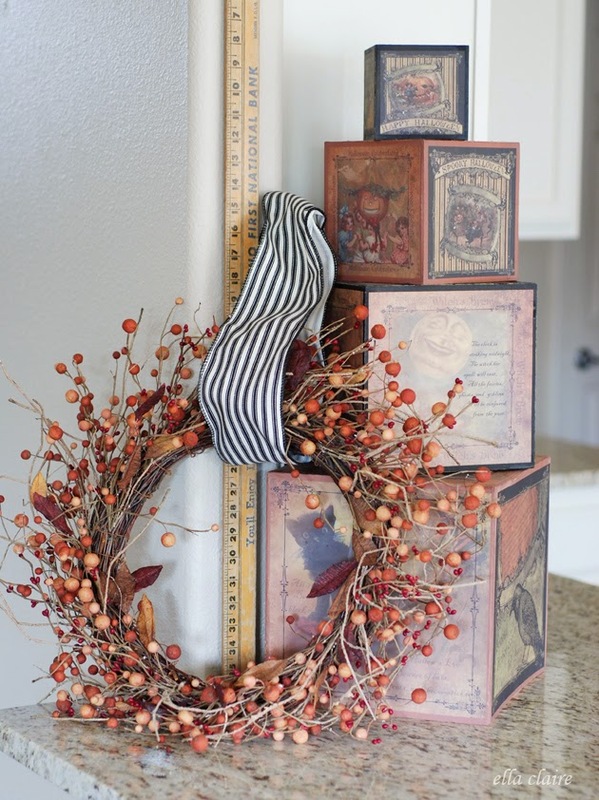 Your home is beautiful Kristen and the Fall and Halloween touches you added look great. 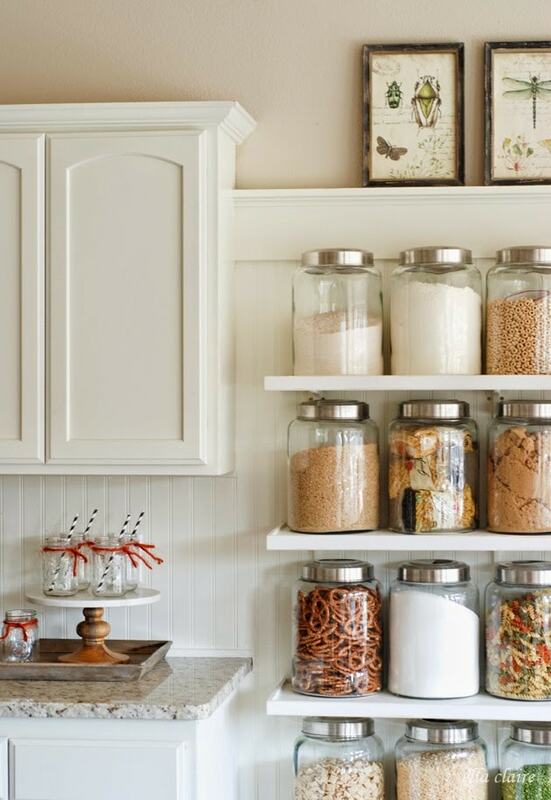 The jar wall is a practical and attractive storage solution. Thanks for sharing. LOVE!!! Ok I’m totally obsessed with your kitchen shelves, so gorgeous and fun! 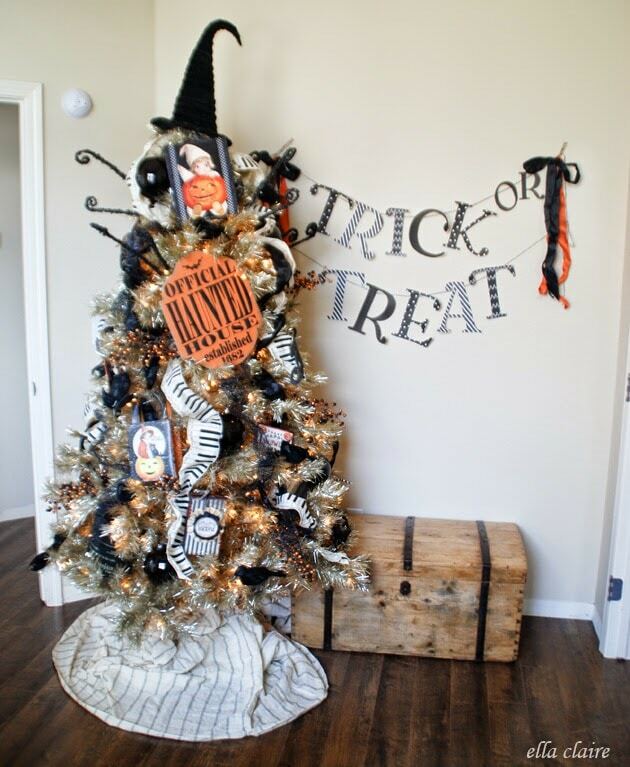 And I’m so happy to see your Halloween tree again, awesome job friend! 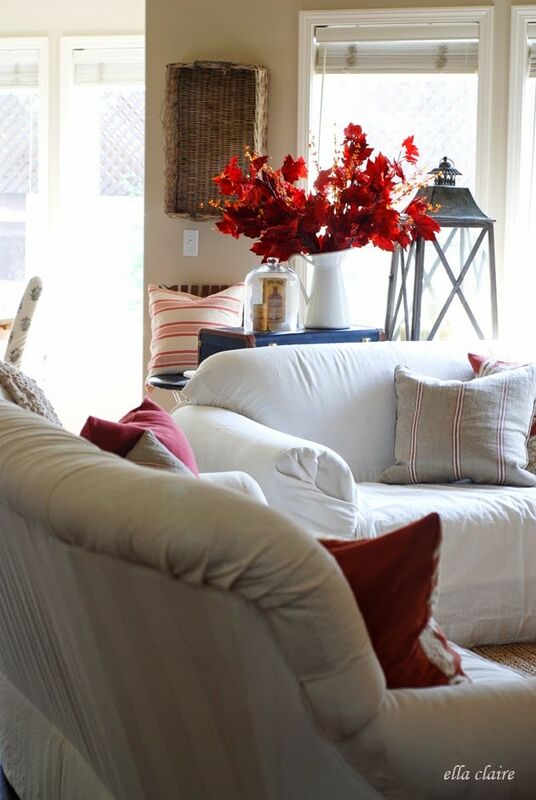 You home is just full of fall beauty! I love your kitchen!!!!! What a great place to cook, bake and create!!! No wonder you are so proud of your pumpkins! As a gardener I know what a pain they can be to grow, but how wonderful the harvest is!!! And you had a wonderful harvest! That wall of kitchen shelves is so pretty. I love the huge jars and they make such a statement all lined up like that. Great job! 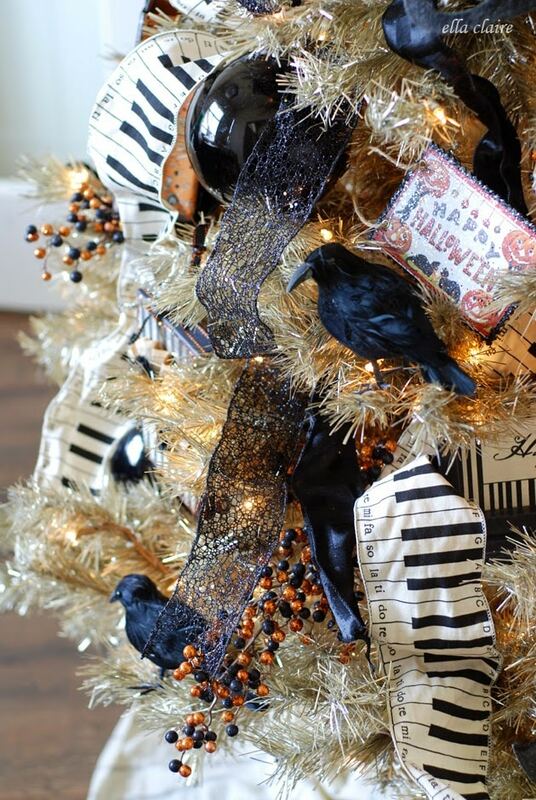 I love your Halloween tinsel tree! Someday I might be brave enough to do one of my own!